There are a few inks that I have been really excited to try for fall, and Robert Oster Caffe Crema is one of them. I saw a picture of it on social media and new I had to give it a try. I got my sample from Vanness Pens. Caffe Crema is a medium brown with shading and black sheen. 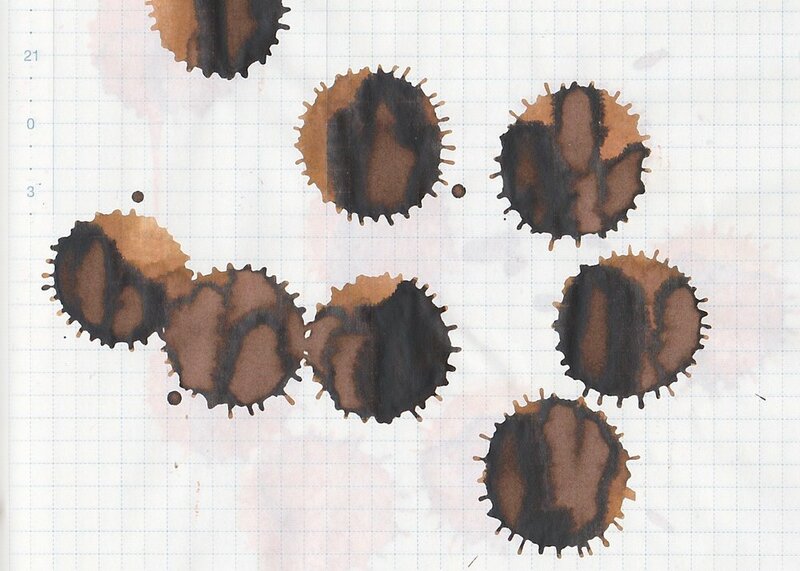 The ink drops show off the nice shading, and the great black sheen. So let's look at how the ink behaves on good paper first. On Moleskine paper, which is not fountain pen friendly, there was some bleeding and a tiny bit of feathering. It did ok, but not great. This is not an ink I would recommend for cheap paper. Ink swabs for comparison, left to right (top to bottom for RSS): Robert Oster Golden Brown, Robert Oster Caffe Crema, and Robert Oster Marrone Mustard. Click here to see the Robert Oster inks together. Marrone Mustard is just a little bit darker than Caffe Crema. Diamine Golden Brown, Diamine Raw Sienna, and Diamine Warm Brown. Click here to see the brown inks together. Raw Sienna is close to Caffe Crema, but has a little bit less yellow in it. I used a Conklin Durograph with a Goulet broad nib on Tomoe River paper. In the broad nib, the ink was pretty wet, and was very smooth. Overall, I really love this ink. I love the shading and the color, it's a great ink for fall. I will need a full bottle of this one.